Our second series, This Is Where…, takes us on a tour of London to discover the possible origins of unusual English phrases. In English, we say that someone has their work cut out when there is a big or complicated task that needs to be completed. Lots of English speakers know what that phrase means, but not many people know where it comes from – as presenter Rav Wilding found out when he went to talk to some Londoners on the street. I’ve got my work cut out for me today: I’ve got to take the kids to their swimming lesson, make a cake, deliver a parcel and hire someone to fix the roof. Dave’s got his work cut out trying to get Arthur to finish that project. He’s been working on it for weeks! Do you know where in London this phrase comes from? Watch the video then complete the next activity. Welcome to the City. This area of London is where bankers and stockbrokers work. City workers look smart and work hard, but how much do they know about where they work? If I said you had you work cut out for you, what does that mean? That I’m very busy and I’ve got a lot to do in a short amount of time. You’ve got quite a lot to do on a certain thing or a project. The traffic’s terrible. I’ve really got my work cut out getting there on time. Where in the world do you think that saying first came from? My guess would be that it’s from some sort of tailoring and having to cut your work out. Would it surprise you to learn that this saying was probably first used on this street, just a little bit up that road? It wouldn’t surprise me at all, no. And what’s the name of this street? Threadneedle Street was the home of tailoring in the 16th and 17th centuries. Tailors worked with assistants. The assistants would cut out the cloth and the tailors would sew it. If the tailor didn’t work quickly enough, the pile of cloth would get bigger and bigger; and because his work was cut out for him, he could clearly see that there was a lot to do and it was all jumbled up in a mess. In other words, he had a really difficult job ahead of him, just like the modern day Londoners here in the city, many of whom do difficult and stressful jobs too. I tell you what… I’ve got my work cut out trying to get across this road! Threadneedle Street was the home of London tailoring in the 16th and 17th centuries. Tailors worked with assistants - the assistant would cut out the cloth and the tailor would sew it. If the tailor didn’t work quickly enough, the pile of cloth would get bigger and messier. Because his work was cut out for him, he could clearly see that there was a lot to do and his work was jumbled up in a mess. In other words, he had a really difficult, complicated job to do. What have you learnt about the meaning of this expression? In the past, if a tailor didn’t work quickly enough, the pile of cloth would get bigger and bigger. And because his work was cut out for him, he could clearly see that there was a lot to do. What do you use a needle and thread for? Who worked in Threadneedle Street in the 16th and 17th centuries? It's connected to being busy. 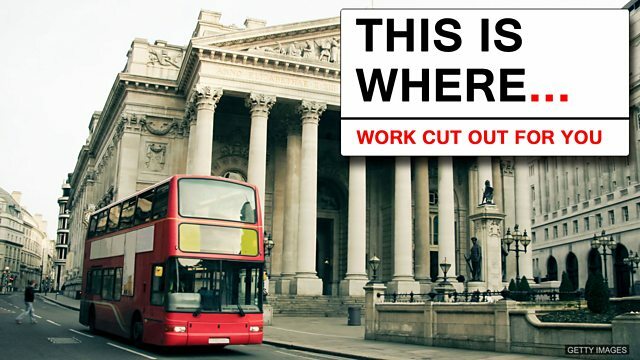 Which one of these sentences contains the correct use of the phrase ‘work cut out’? You can download the PDF document for this episode here. Join us in Session 8 of The Experiment where we discover the origins of another London-born phrase.